The alarm went off at 3 a.m. I wiped sleep from my eyes and mumbled something into my sleeping bag. 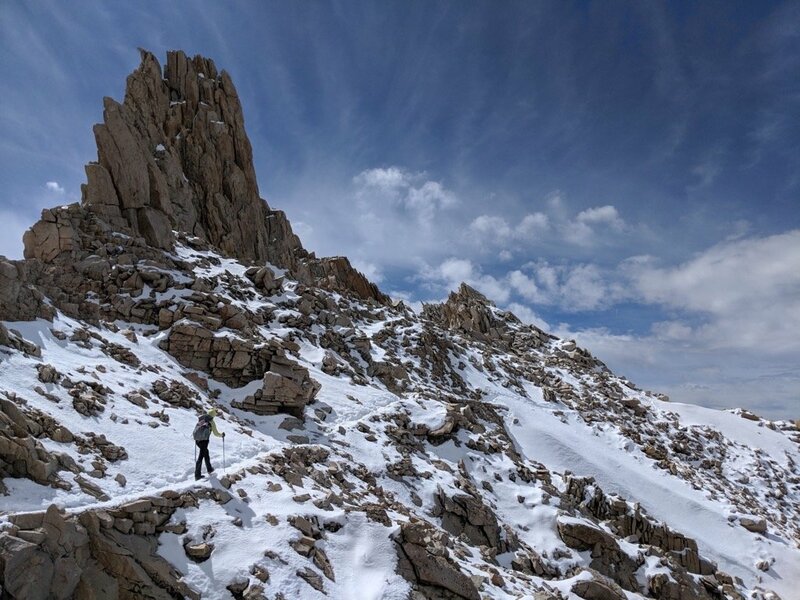 I was driven — summiting Mount Whitney was my long-awaited dream. It took me an extra five minutes to squeeze my warm feet into my boots, which got wet during a knee-deep ford then froze overnight. 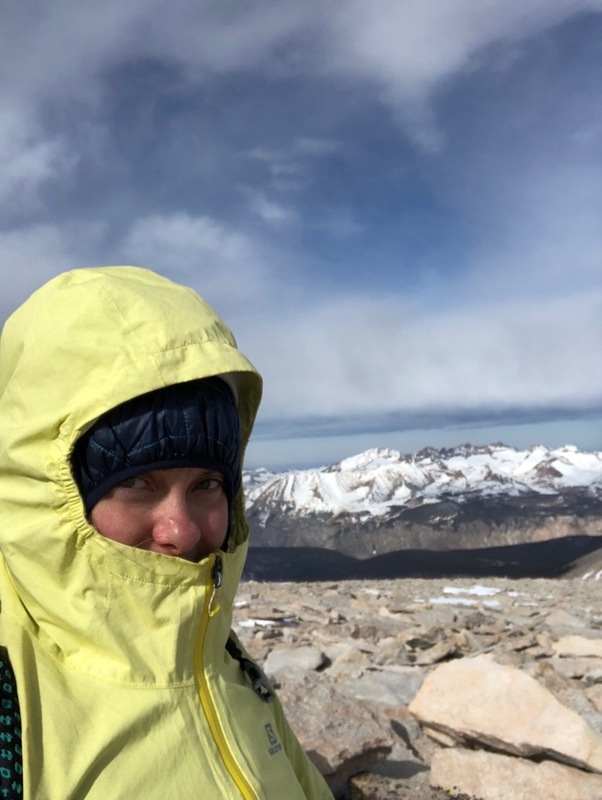 Under the moonlight and equipped with headlamps, crampons, ice axes and gaiters, we started a slow ascent in our attempt to conquer the highest summit in the contiguous United States. I was excited to use my new snow equipment that I picked up at the mountaineering store in Bishop a few days earlier. One-third through the climb, after watching my movements, “Good News” educationally scolded me, and I understood that carrying my ice axe with the pick facing away from my body is of paramount importance. A death on Whitney just a day before confirmed that this was serious business. That being said, safety-oriented Good News was still mentally adjusting to the idea that I was using the ice axe and crampons for the first time in my life. Photos by Evelina “Foodie” Averyanova and David “Good News” Wichman. The weather wasn’t cooperating; without knowing, we’d picked the windiest and coldest day of the week. With every step the temperature dropped and wind gained strength. It felt like we were walking naked for hours under the icy waterfall. After an hour of climbing, I stopped feeling my limbs, and my nose was sniveling uncontrollably on my neon yellow Salomon raincoat. I was breathing heavily in thinning oxygen and unable to motivate myself to take another step. “What the hell am I doing here? !” I asked myself. For a moment my mind drifted a few months back. I remembered sitting under fluorescent lights in a suffocating New York office, working on another endless deadline, eyes about to bleed from computer screen light. Suddenly, after that flashback, survival instinct kicked in. 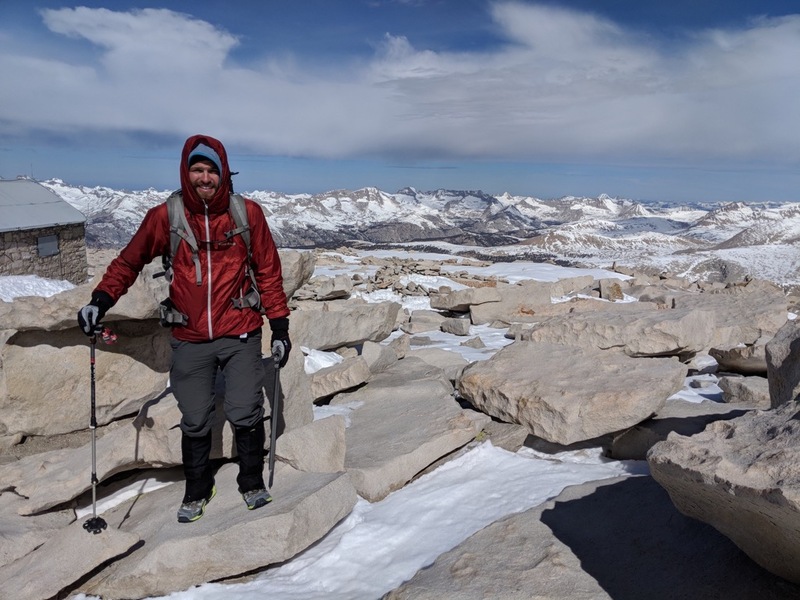 At the same time, Mount Whitney underwent another of its little changes. The dawn light penetrated every slope in a multicolored blue, purple and grey infinity of mountains. Suddenly, I knew the answer to my question too well. I took a step, then another and another until I bumped into another hiker. “Where is it?” I whispered with my fading vocal cords cutting off greeting formalities. “Where is what?” he asked back in confusion, looking at my ice axe, not understanding the urgency. I was anxious and needed more information. “How far?” I insisted. Considering weather conditions, it was indeed far and uphill. For another hour, while the nippy wind continued raging under the cloudy sky, I climbed on, doubting myself along the way. At the top of the mountain I reached a field of spreading boulders, and the rare footprints in the snow disappeared completely. It wasn’t clear anymore in which direction I should continue moving. The GPS was showing my location slightly off the path, and a deceiving cairn ahead could have been mistaken for a viewpoint marker or something else altogether. 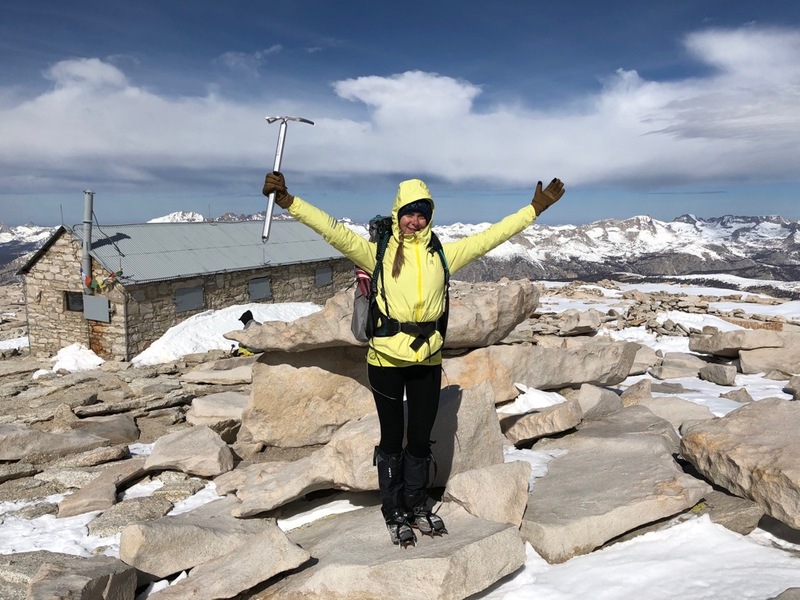 The otherworldly views reaffirmed that I was motivated to reach the summit, not only for the rewarding views but to honor what I had endured to get there. It was too cold for much contemplation, so after a few selfies, I was ready to start a brisk descent. It weighed heavily on my mind that I couldn’t see Good News and my surroundings left it unclear whether I had reached the summit. It didn’t add up that he would leave the top without me. Hiding my frozen chin and nose in the collar of my coat, I spotted an ascending couple on the horizon. They were bundled in multiple layers and for a second I envied their warm down pants. “Did you see anyone coming down?” I asked, hoping for word of Good News. 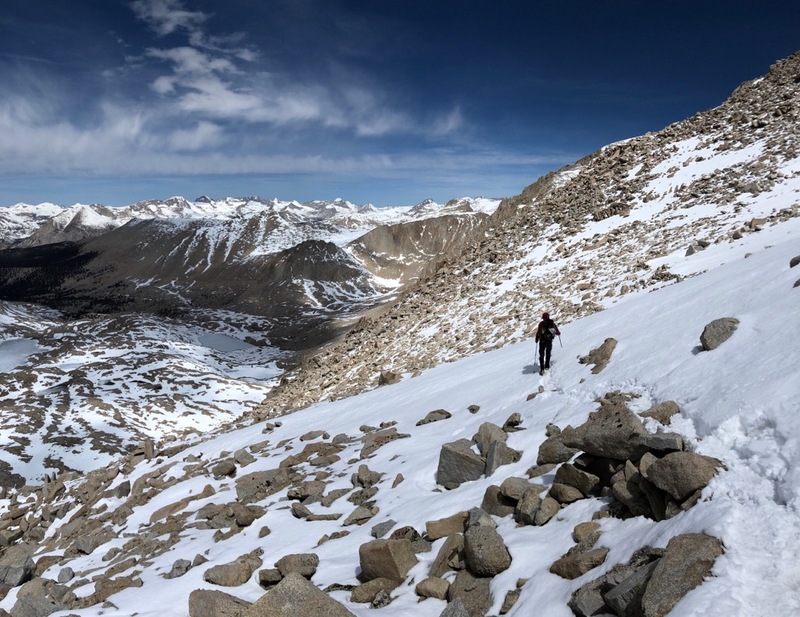 “Not a soul,” a frozen hiker answered briefly as he tried to gauge the true summit. I joined them, and together we climbed boulders for another 50 feet. My body was electric with excitement when a stone hut structure appeared ahead. I had almost missed the real summit after all! Inside the Stone Hut and in a snowdrift almost up to the roof I discovered Good News waiting. We both were shivering. “Your lips are blue!” With that exclamation he handed me a bag with gummy worms and, while I was eating, rubbed my body trying to warm me up. By that time my brain was processing only every other scene of reality. After obligatory pictures we rushed toward lower elevation. I was descending, smiling with joy and satisfaction when suddenly my crampon got caught in the gaiter, sending me airborne, then on my hands and knees. Fortunately, I landed on a flat ice edge, the near-miss a humble reminder that the mountain basically owned me and not the other way around. This experience underscored why we left the womb-like coziness of our homes and stability of corporate jobs to discover a world we didn’t know existed, to hike thousands of miles in the backyard of my adopted country, intentionally moving outside our comfort zone to test our limits. 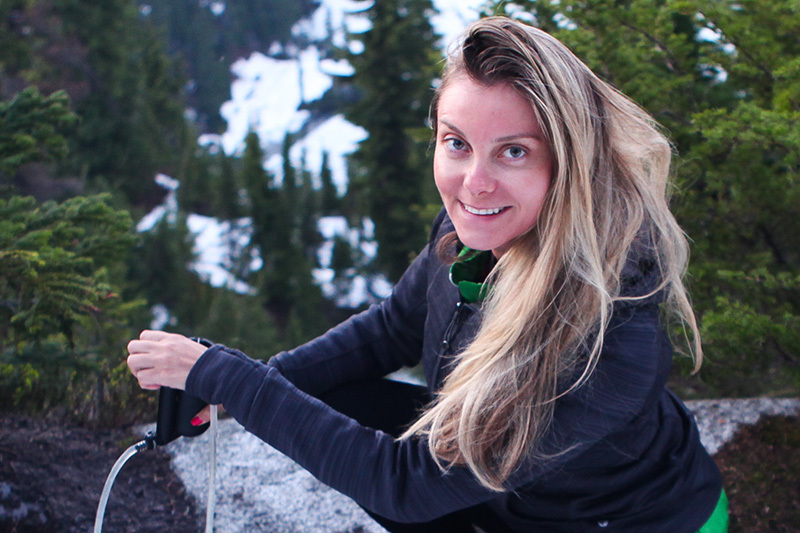 Evelina Averyanova is taking on the PCT in a mission of self-rediscovery. In her past, Evelina was a traveling architect. Now, she heads out on this spiritual quest to find what else life has to offer. Beyond her personal self-searching goals, she also hikes with the commitment of promotion, preservation and protection of public lands. Join Evelina as she seeks to inspire people to get outside and connect with the Mother Earth. Follow her on Instagram.